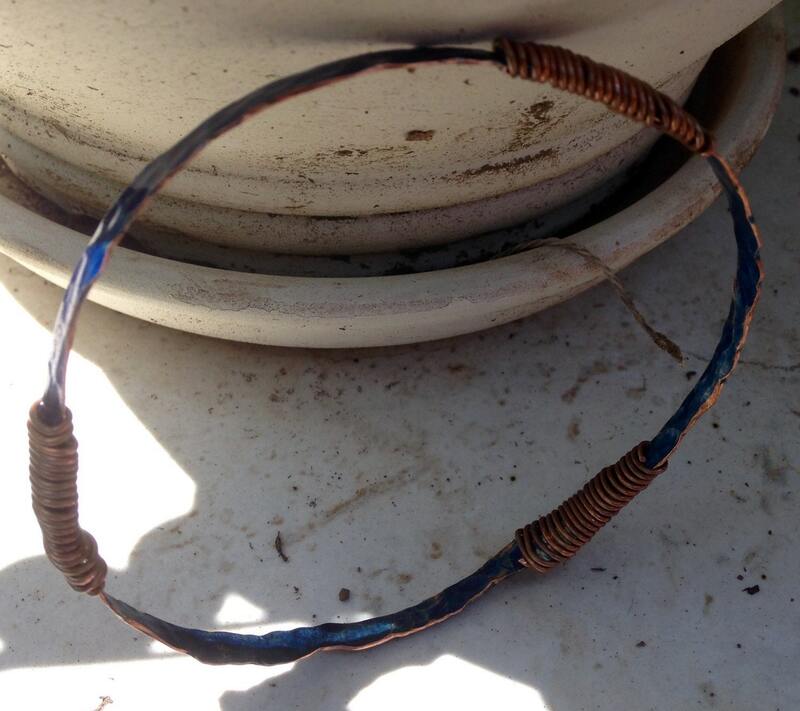 Using 3 pieces of reclaimed copper wire, I hammered them and riveted the pieces together to make this one of a kind bracelet. When you hammer copper, you obviously make it flat. And when you texture it with the round end of a ball pean hammer, it creates a very organic shape. No longer a straight and flat piece of wire, but dimpled and curvy. I riveted the pieces together to give this bracelet stability and then wrapped each joint in a rustic copper wire, that gave contrast and more texture. Then came the color. Alcohol ink gave this bracelet a rich translucent blue. I sanded the edges to show the original copper. I sealed everything to give it staying power. This bracelet is for a bigger hand and larger wrist. Super light weight and wearable. I always wear each piece of jewelry I make, to make sure that you can wear it. Measures 3" in diameter, which would qualify it as large/extra large. If you would like a smaller bracelet or in a different color, convo me.